Pharma-Zentrale was founded in 1953 and is located in Herdecke, a historic trading place and picturesque city in the heart of North Rhine-Westphalia, Germany. Even today the company is a family business, representing a group of subsidiaries, each one a successful specialist in its particular pharmaceutical or biotechnological businesses. Our company group comprises BBT Biotech, Ardeypharm, Dr. Poehlmann & Co. and Dr. Ponsold Pharma. The services and cooperation we offer are highly valued by our customers across the globe. We implement life-cycle management in all aspects and fields of our pharmaceutical business. Together with our partners, we will succeed in future business and regulatory challenges. 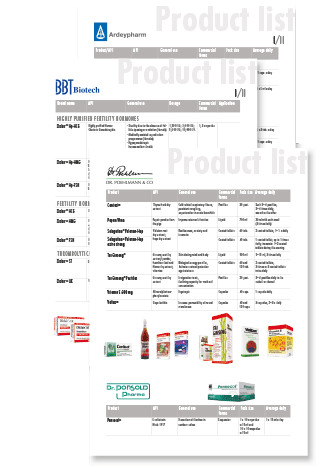 Follow our complete product list with information about general use, dosage, commercial forms, pack sizes and average daily. If you want to know more about a product or API in particular, please use the contact-form - we will return as soon as possible.